Blogs on Health and Wellness and Innovation using standard WordPress blog features (posts, categories, comments, media integration). Sets of wiki pages used for knowledge sharing, project work, and communications. 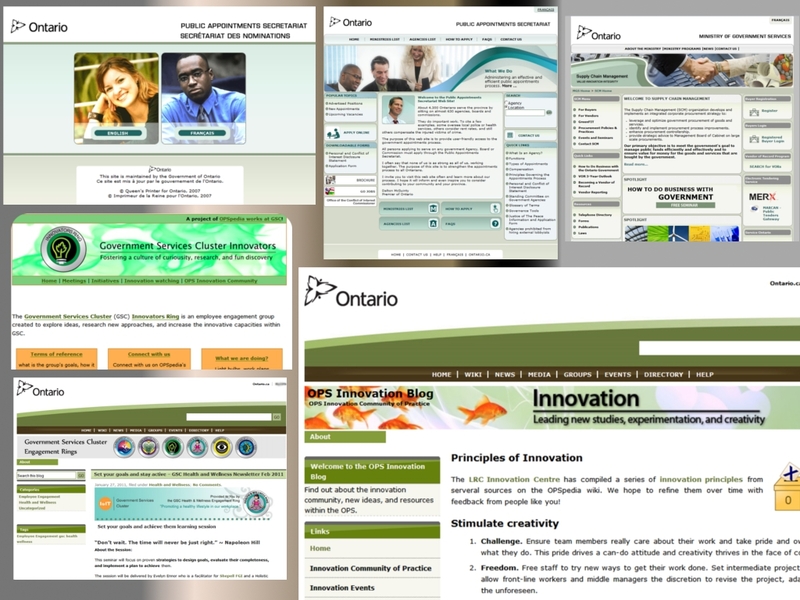 Intranet divisional websites used for client communications and information sharing. Web applications with integration of portal, security public key infrastructure, and web services. First government inter-jurisdictional messaging gateway in Canada. Gateway uses FTP, SOAP, HTTP/S, web services, and custom interfaces. Ontario Supply Chain Management (procurement) portal with electronic forms, reporting, and custom search and data query.